GoXtra News: The 16th Annual Business Day BASA Awards, supported by Anglo American, 2012 winners announced! 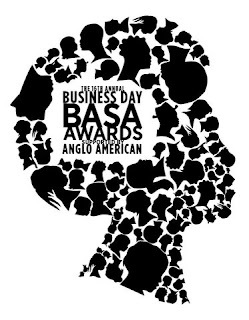 The 16th Annual Business Day BASA Awards, supported by Anglo American, 2012 winners announced! The Johannesburg City Hall proved an appropriate venue when the sixteen winners of 16th Annual Business Day BASA Awards, supported by Anglo American, were announced last night. Nearly 100 years after the landmark building was completed, the cultural heritage it represents was reaffirmed by the diversity and creativity of the 12 business and arts partnerships that were celebrated at the event – as well as the winners in the three categories chosen by the Business and Arts South Africa board. Among the latter was the winner of the Diplomacy in the Arts award - the Embassy of France. It was honoured for the France-South Africa Seasons, a multi-faceted arts collaboration between the two countries that started in South Africa in July 2012. “We’re thrilled to have grown South Africa’s only awards recognising business arts partnerships,” comments Business and Arts South Africa CEO, Michelle Constant. “At the very core of what we do are successful partnerships that contribute to the sustainability of the arts but that also benefit both parties in that relationship. “The BASA Awards are always a powerful reminder to the South African business community that, just outside their door, is a society filled with an abundance of different arts,” says Peter Bruce, Business Day Editor-In-Chief. Jack Ginsberg, a founding patron of The Ampersand Foundation (TAF), received the Art Champion Award, given to an individual for outstanding achievement in the encouragement and support of the arts. TAF supports South African artists and those working in the visual arts with a residency in New York. The Distell Foundation was this year’s recipient of the prestigious Chairman’s Premier Award, awarded at the discretion of the Chairman of Business and Arts South Africa to celebrate sustained and extraordinary commitment to the arts in South Africa. Distell Foundation is the umbrella body for Distell’s corporate citizenship activities, with a strong emphasis on arts and culture. Mentor of the Year, supported by Etana Insurance, was awarded to Hilton Lawler for his work with Assemblage, a body that aims to connect and nurture Joburg’s visual arts community. This is the second time that Lawler has been named winner in the category: his work with the Origins Centre saw Lawler named Mentor of the Year at the 13th Annual Business Day BASA Awards, supported by Anglo American. For the first time there was a double winner in the Youth Development Award category with the judging panel selecting both Sasol Limited for the South African National Youth Orchestra and Rand Merchant Bank for the Durban Music School. And the recognition of Cape Town’s Alexander Bar & Café for its partnership with the Alexander Upstairs (a micro-theatre) was yet more proof that a relationship between business and the arts can come in small, yet highly effective, ways. This year’s winners also include two business arts partnerships forged by local government and municipalities. The Johannesburg Development Agency won the Increasing Access to the Arts Award for the Diepsloot Public Artworks Programme while the Arts & Environment Award, supported by Nedbank, was awarded to the uMngeni Municipality for the Nelson Mandela Capture Site. Another notable win was the Long Term Partnership Award, supported by new sponsor Stephan Weltz & Co. It went to ArcelorMittal South Africa for its three-year partnership with the Southern Guild Collectable Design Gallery, which underscores the benefits of longstanding relationships between business and the arts. This year’s Award ceremony was the last year of sponsorship by Anglo American, and in celebration of their years of support, Business and Arts South Africa commissioned a choral work, composed by James Bassingthwaite, which was performed on the evening by the Mzansi Youth Choir. The work remains as a legacy and gift for Anglo American. This year’s awards were judged by an independent panel of judges that evaluated the success of each partnership in achieving its objectives and in bringing genuine value and benefit to both partners. The results were audited by Grant Thornton. The judging panel was comprised of CEO of the Mastrantonio Group and BASA Board member Giovanni Mariano; Fikile Moeti - Radio DJ , TV presenter, leadership Enthusiast and Social Entrepreneur; Theresho Selesho - Experiential Marketing Director at Ogilvy and Mather and Dali Tambo - TV Host, CEO of the National Heritage Project Company& Founder of Artists Against Apartheid. Long Term Partnership Award supported, by Stephan Weltz & CO.